Leaves: Leaves are green with spiny toothed edges. When young they are smooth but with age become hairy or downy. Fruits & Seeds: Seeds are small, light brown and have tan hair loosely attached to the tip to enable wind dispersal. Seeds most often are spread by mowing after the flowing has begun. Roots: Has horizontal roots that grow up to 10-12' per year and also had taproots that can grow more then 6' deep. 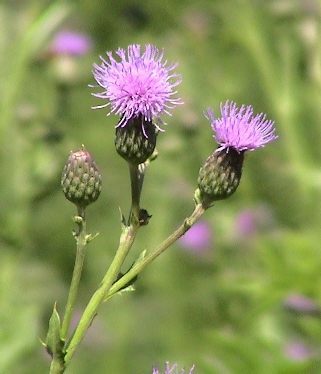 Canada thistle invades forest openings, oak savannas, prairies, dunes, agricultural fields, pastures and roadsides. Once established in an area Canada thistle will spread and take over the area very quickly.